On July 21, roughly a hundred people arrived at the West County Detention Facility in Richmond in order to hold a vigil observing Tisha B'Av, a Jewish day of fasting and communal mourning. Oakland-based Kehilla Community Synagogue coordinated the event as a way to show solidarity with the immigrants detained at the jail, who are being held by the county as part of a contract the Contra Costa Sheriff's office has with Immigration and Customs Enforcement. Instead, they were met with a chain-link fence around the facility, barricades, and sheriff's department vehicles with flashing lights, blocking their entrance to the jail parking lot. Dev Noily, a senior rabbi with Kehilla, said Captain Jose R. Beltran of the Contra Costa Sheriff's Department told them that the parking lot was now restricted to employees and official visitors, and that their vigil would have to be held in a field south of the jail. Local residents and activists have been holding vigils and demonstrations at the West County Detention Facility for more than seven years. But earlier this month, the Contra Costa Sheriff's Office banned all demonstrations from the jail's grounds. It's not just protests and demonstrations that are prohibited, though. Advocates and volunteers with local organizations say the restrictions are also preventing them from providing support services for detained immigrants and their families. Local activists and spiritual leaders say the new policy is a repression of free speech and an effort to limit transparency as the department ends its contract with ICE. First Amendment lawyers are also questioning the department's actions. "The fact that this location has been used for at least seven years for general demonstrations or vigils by religious groups suggests to me pretty strongly that this is a traditional public forum," said David Snyder, executive director for the First Amendment Coalition. There are three types of forums that have been established by the U.S. Supreme Court and used to consider matters of expressive and speech-related issues: Traditional public forums are places with a long tradition of freedom of expression and considered the most protected from government interference. Limited public forums are those reserved for certain engagements and subjects, such as an auditorium in a public building. The third group, closed public forums, are areas the public doesn't traditionally have access to, like the inside of a jail. "The government can't just convert a traditional public forum into a limited public forum by fiat," Snyder said. Contra Costa County Sheriff David Livingston defended the jail's new policy during a July 24 public forum with the county's Board of Supervisors. "It's a jail. It's a secure facility," said Livingston. "The reality is that we have business to conduct there, and the reality is that we need to maintain the safety of that facility, the safety of the inmates, staff, and the visitors." But Livingston did not give details or examples of how demonstrations have impacted security at the facility. Allegations of inhumane conditions at the facility, in combination with a growing national movement to abolish ICE, have caused the number of demonstrators at the West County Detention Facility to steadily grow. On June 30, thousands of protesters arrived at the Richmond jail to challenge the immigration policies of the Trump administration, criticize the sheriff's cooperation with ICE, and express solidarity with the detained immigrants. Reverend Deborah Lee, the executive director for the Interfaith Movement for Human Integrity, a local inter-religious immigrants' rights organization, said the June 30 protest was a "very special day" that saw tens of thousands of protesters turn out nationwide in support of immigrants' rights. Lee has helped organize over a hundred vigils on the first Saturday of every month at West County Detention Facility since the county began contracting with ICE in 2011. She said deputies have rarely come out to check on their events. She added that her organization was "disappointed and disturbed" to hear that the sheriff was banning future gatherings. "We've always been very clear that this is a prayer vigil," she said. "It's for the families of those that are detained to be able to receive spiritual support. I think that this really reflects the disdain and lack of concern that the sheriff's office has for immigrant families who are being impacted by detention and deportation." It's not just the vigils that have been barred from the premises. Lee's organization coordinates volunteers to check in with detained immigrants during visiting hours and provide support services, in the form of food and other resources, for their families. Last Thursday, those volunteers were kept from the jail grounds, she said. Two days before, the sheriff's office released a statement to the Express from Assistant Sheriff Matt Schuler, who oversees custody services for the department, saying that protests had placed "overwhelming demands" on the office's resources and facility's security, and were no longer allowed on-site. The statement made no mention of volunteers or other faith-based events. When questioned about the volunteers being barred from the jail on Thursday, Jimmy Lee, a spokesperson for the sheriff's office, said he could not comment because they were looking into the issue. Lee said that her organization is having some attorneys look into these new developments, but James Wheaton, founder and senior counsel at the Oakland-based First Amendment Project, said that while the sheriff's security rationale for the ban was "tissue-thin," the courts commonly rule in favor of those who run jails and prisons. "It's unfortunate what they've done," Wheaton said of the sheriff's new policy. "They certainly could have done something less obstructive of public protest, but they opted for the most restrictive and least protective of First Amendment rights." Juan Prieto, an organizer with the California Immigrant Youth Justice Alliance, agrees and sees the ban as little more than a new tactic in a long line of efforts by the sheriff's office to impede the efforts of local immigrants' rights activists. "It's retaliation against those who have assembled, protested, and placed pressure against Sheriff Livingston and the West County Detention Facility's contract with ICE," he said. "It provides less opportunity to hold him accountable." The sheriff's office receives $6 million a year to hold roughly 200 immigrants facing deportation by ICE. Allegations of unsanitary conditions, inappropriate medical treatment, and questionable conduct by deputies have been raised by both men and women formerly held at the facility. Rebecca Merton, an independent monitor and national visitation coordinator with the organization Freedom for Immigrants, has been at the forefront of documenting those allegations, and said that she has never heard of a security problem with demonstrations. Merton's organization, formerly known as Community Initiatives for Visiting Immigrants in Confinement, or CIVIC, has had its own issues with providing support and services, such as a legal hotline and sending letters to families, for detainees. 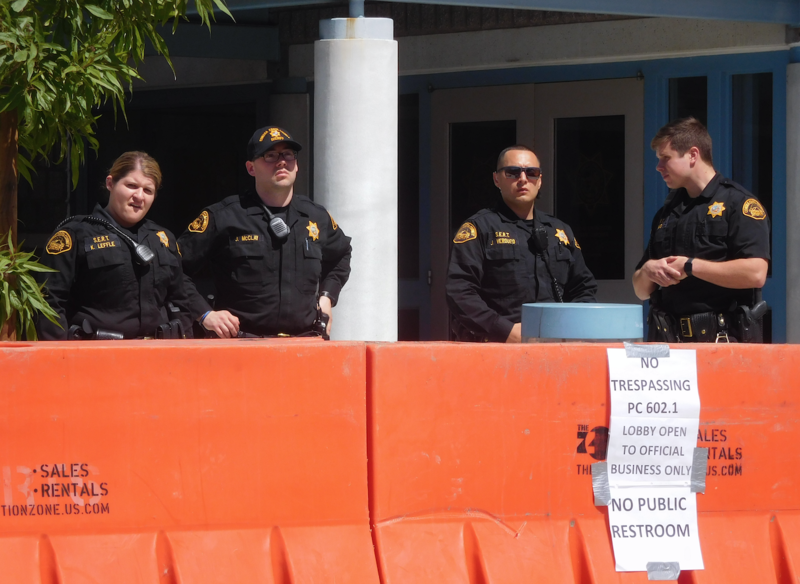 In mid-February, after years of providing those services without incident, the organization had its access to the jail ICE revoked by the Contra Costa Sheriff's Office, citing security matters and policy violations. Merton's organization has been challenging those reasons, and, on July 20, Freedom for Immigrants informed the Contra Costa Sheriff's Office and the county counsel that it intended to bring a First Amendment lawsuit against the county. A few days later, the sheriff's office signed a memorandum of agreement, reinstating Freedom for Immigrants' access to the jail. Last Friday, volunteers were able to speak with detained immigrants for the first time in months. "We heard that the abuse from deputies continue," Merton said. "It's further evidence that the sheriff's unilateral decision to end the contract wasn't based at all on justice, but just the desire to display power." On July 10, Livingston announced that his office would be terminating its contract with ICE after the mandatory 120-day waiting period, but activists say that ending the contract doesn't solve larger systemic issues of mass incarceration, or help those who will be transferred to new facilities outside of the state and far away from their families. Immigrants' rights advocates argue that the protest ban shows the lack of concern the sheriff and his office have for a smooth transition, and that the new policy directing future demonstrations to the Giant Highway will not deter people from participating. Several groups have already announced their intention to stand with the Interfaith Movement for Human Integrity during their next Saturday vigil on August 4, right outside the jail's entrance.